find command is used for locate files in a directory hierarchy on Linux/Unix systems. You can search for files according to name, owner, group, type, permissions, date and other criteria. The search is recursive in that it will search all sub directories too. If you are a beginner, the following examples will make you clear about the find command. The following commands will search the files with their name. Say for example, if your file name is unixmen.txt, then you can find this file using anyone of the below commands. The above command will search the file unixmen.txt in your root (/) directory and all its sub-directories. As you seen in the above command, I have used combination of small and capital letters. The find command will ignore the case sensitivity and find the actual fileunixmen.txt. To search files based on their size, use the parameter -size with find command. For more information about find command usages, refer the man pages. Through this article we are sharing our day-to-day Linux find command experience and its usage in the form of examples. 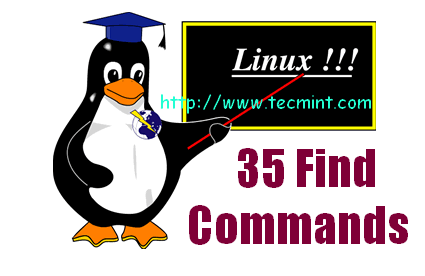 In this article we will show you the most used 35 Find Commandsexamples in Linux. We have divided the section into Five parts from basic to advance usage of find command. Find all the files whose name is tecmint.txt and contains both capital and small letters in /homedirectory.